People who remember the days of the typewriter can tell you of the excitement when the Mac came around and we had something like 32 typefaces with up to four or five different "effects" that could be combined when using them. 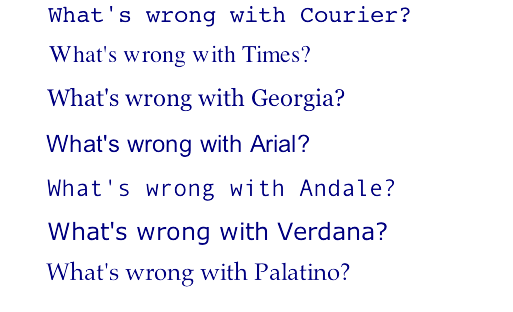 And now we have so many more and yet, how often do we pause to think about which typeface to use instead of using the default? 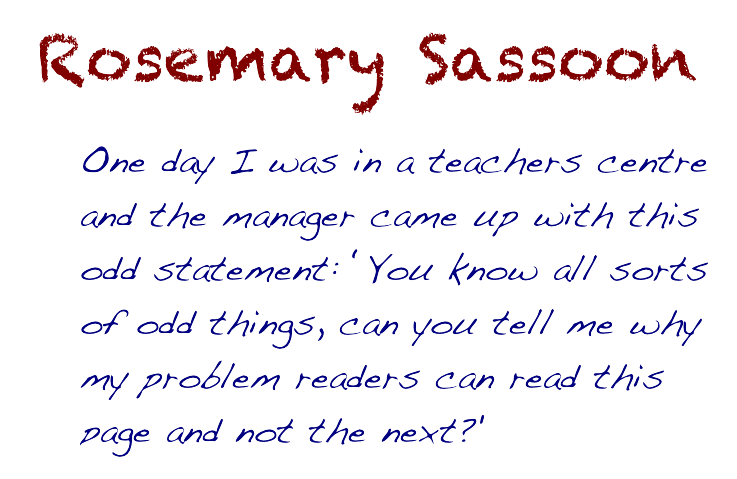 Moreover, how relevant is typography to software design, a question which Rosemary Sassoon believes is worth asking? 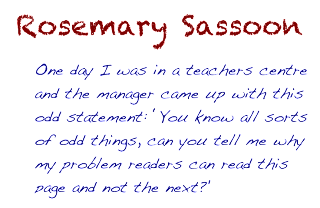 Remember Sassoon's claim that choosing the right typeface can bridge the gap between reading and writing for children? What exactly is that gap -- and what would be wrong about using any of the very standard and commonly-available typefaces shown below in an educational software product aimed at new readers? 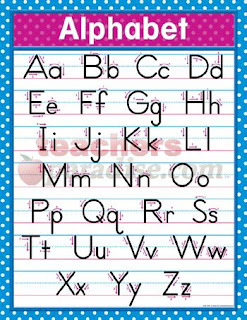 Look at the incongruence between how children are taught to print a lowercase "a" and how the same letter is given an entirely different representation in the "standard" typefaces above. Bonus points if you can spot the additional letter in some of those typefaces which is similarly problematic. 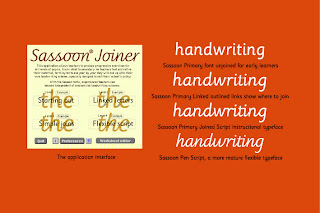 Thus was born the Sassoon font family and Sassoon Joiner educational software program, a program made possible and designed by Sassoon (in the midst of a Ph.D. program in Typography and Graphic Design) and an associate in LiveCode and fine-tuned by a LC developer. Click here to see the different letterforms and the application in action as it determines which letterform to use. The screen video doesn't quite show it here, but when I was typing in the application, you could see the app "change its mind" about which letterform to use, which is interesting to see. Why LiveCode? 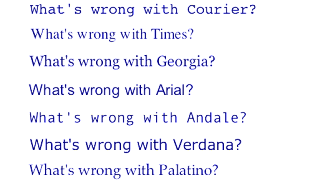 Williams continues, A program was required to control the fonts. I had been following the progress of Runtime Revolution for some time, I took the plunge and bought it, giving me the opportunity to quickly make a first test program. As I had never coded before, its language quickly endeared me to it. Why does cursive handwriting still matter? As Williams points out, Surprisingly, in the past many schools had no consistent handwriting policy, but left it to individual teachers' methods to instruct pupils. 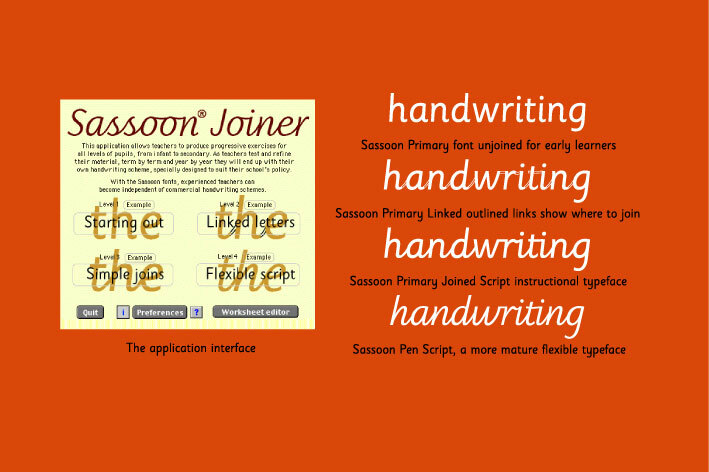 The idea for Sassoon Joiner arose from the decline of traditional blackboard and chalk in favor of whiteboard screens in classrooms, offering an ideal way to display handwriting to the whole class by any teacher. Other reasons for supporting cursive handwriting include There is now quite a lot of new data that indicates handwriting has a powerful and positive impact on reading. Moreover well-taught cursive writing is faster and more efficient than printing, and will consequently have a greater long-term effect on the student’s performance in school, according to Richard McManus of The Fluency Factory. For centuries, cursive handwriting has been an art. To a growing number of young people, it is a mystery. These range from issues regarding identity theft due to simple block printing signatures that are easy to duplicate and declining fine motor skill development in children. Perhaps the saddest observation was that a connection to archival material is lost when students turn away from cursive, noting that one college student and her cousin experienced great difficulties in reading their grandmother's handwritten journal. And, finally, getting back to Mr. Jobs' observation on the utility of beauty, Richard S. Christen, a professor of education at the University of Portland in Oregon, points out that These kids are losing time where they create beauty every day... I’m mourning the [loss of] beauty, the aesthetics.